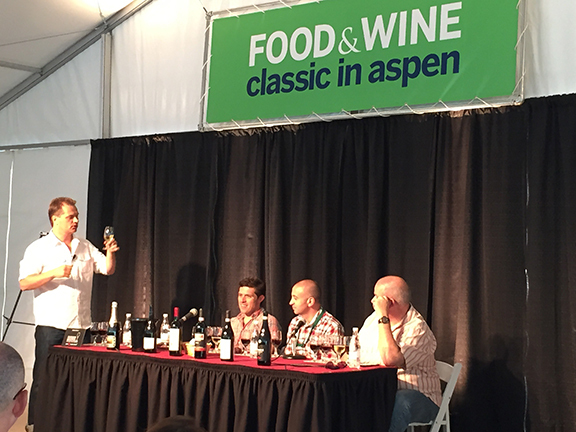 In June of this year, Master Sommelier Shayn Bjornholm (above, left) asked me to be on an Aspen Food & Wine panel devoted to “big and bold” Italian wines. But Shayn, who is a super cool dude, suggested that I present a Franciacorta as my wine. After each of our sessions, Shayn offered to let the panelists take a bottle of wine for the evening that lay ahead. “Sure, of course!” I said as I felt entirely stoked that he liked it enough to want to drink it himself! Little did I know that he would recommend it in the August issue of Robb Report, where he is featured. The magazine is the leading luxury lifestyle magazine in the world today and I am thrilled that a Franciacorta, together with Shayn’s expert notes, grace its pages. And thank you, Shayn, for digging Franciacorta! You ROCK! Previous post ← Harvest has begun!